However, a really convincing test would be require including the the Medieval Warm Period, a time when temperatures were similar to those of today. 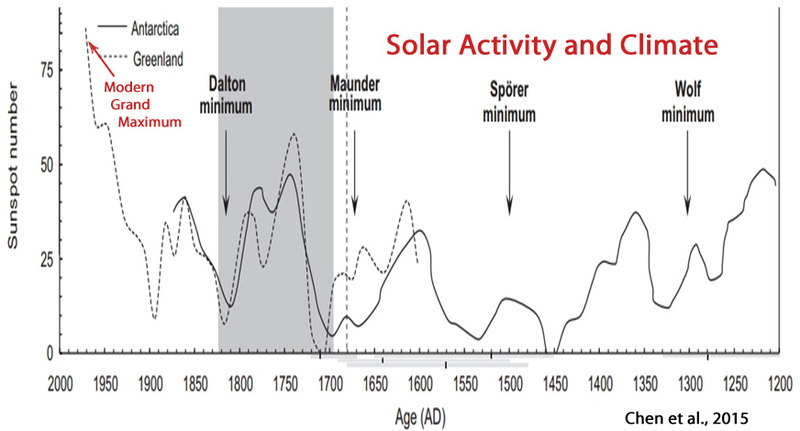 The atmospheric CO2 concentration was low while solar activity was high. Once again a good opportunity got passed up. Ignored here were the strong paleo-climatological indicators that the sun had significant involvement on the climate climate. At notrickszone Kenneth Richard presented an entire series of new studies. In September 2016, Andy May presented a nice overview of the thousand-year cycles over at WUWT. Can you spot the difference between both patterns? Of course there should be a relation between the Sun’s output and climate on Earth, but why do some people think that all changes can be attributed to the Sun or other natural sources of warming/cooling? Just so “it can’t be CO2”? What percentage of net 0-4000 m ocean heat changes are caused by 0.000001 (parts per million) carbon dioxide variations relative to natural sources of warming/cooling, SebastianH? What percentage of the net 0-4000 m ocean heat changes were caused by 0.000001 carbon dioxide variations during the warming trend from the Dark Ages Cold Period (~450 – 850 AD) to Medieval Warm Period (900 -1250 AD) and then from the Medieval Warm Period to the Little Ice Age (1300-1900 AD) relative to the percentage caused by natural sources? At what point did those natural sources stop dominating as causes of net changes in ocean heat content relative to 0.000001 changes in atmospheric CO2? What year? What ppm level? If the ocean heat change is the result of an average forcing of X and we have such a forcing to attribute that to, then 100% of the change is caused by that forcing. Why? Because the change would not have happened without that forcing. Of course this is only true if you “believe” in the universal nature of the laws of physics. Therefor: steel greenhouse … Will a core with constant heat source get warmer with a surrounding shell thant without it? In vacuum with only radiation as the means to transfer energy. So can we presume that it is your belief that 100% of net ocean heat changes in the 0-4000 m layer are caused by atmospheric carbon dioxide variations, and 0% are caused by natural forcing factors? What year did the 100%-0% takeover occur? In other words, what year did humans first cause 100% of net ocean heat changes, and what year did natural forcing drop from 100% to 0%? Was there a gradual human takeover, or did it go from 100% natural to 0% natural within a very short period of time? What caused the net ocean heat changes to plummet from the Holocene Thermal Maximum to the present, considering CO2 rose as OHC cooled? Did natural factors override CO2 forcing during this period, or did CO2 concentrations cause these temperature changes too? If so, why did they switch sign? 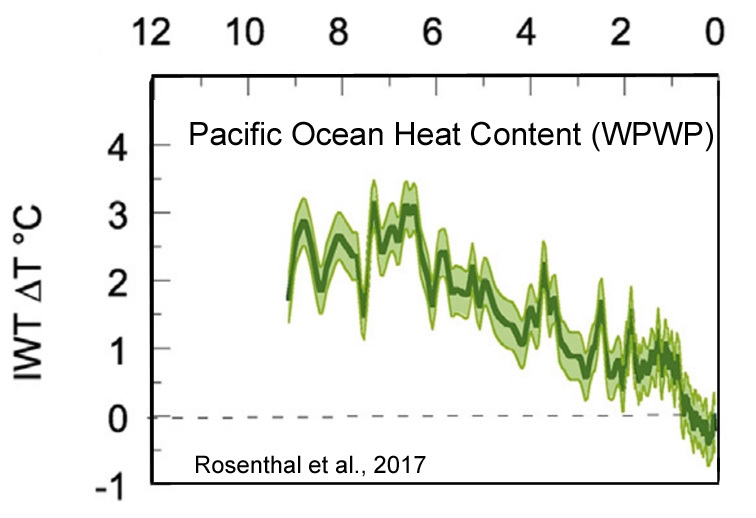 You can assume that I think that the entire change in ocean heat content in this graph (https://www.nodc.noaa.gov/OC5/3M_HEAT_CONTENT/heat_content2000m.png) equals 0.525 W/m² over 50 years which is about the same as the average CO2 forcing in those years. Natural forcings still occured in that same period and they might be bigger in magnitude and with a different sign, but it should be obvious, that if the 0.525 W/m² “human” forcing would not have been there OHC would not have increased by 3*10^23 Joules. No takeovers, just a question of accounting. Same as with CO2 concentration and who caused it. I’d like to repeat the graphs from the first comment http://imgur.com/a/eJFf9 and add that those periodic changes also override the small exponential curve, but at the end the values are 0.9° higher than they would have been without that additional curve. Do you understand what I mean or will you continue to ask questions implying that all other mechanisms need to stop in order for CO2 to have a warming effect? In other words, since the models say that OHC increased between 1955-2010, therefore it is obvious that humans 100% caused it. Right? And since the models say that OHC decreased (dramatically) between the MWP and LIA, therefore it is obvious that humans caused this change 100% too. Right? Or no? If no, what did cause the OHC to plummet between the MWP and LIA? And at what point did those factors cease operating as causes (0%) of more recent net changes in OHC? I understand that it is your belief that all other natural forcings began contributing 0% to net ocean heat content changes beginning in the year 1955, but that still doesn’t address the question as to how forcing factors that “used to” cause 100% of OHC changes rather suddenly were eliminated and therefore contributed 0% once atmospheric CO2 concentrations began changing by +0.000001 per year. Are there other observed physical processes where it has been verified that 100% physical causes of real-world physical meteorological phenomena (i.e., lightning storms, cyclones, tsunamis…) were suddenly eliminated, contributing 0% within a few years after they had contributed 100%? It would appear that the burden of proof (or, at the very least, the burden to provide physical evidence) would be on you to explain why ocean heat content changes are 0% caused by natural forcing factors, and human CO2 emissions cause 100% of OHC changes, as that is obviously an extraordinary claim, and extraordinary claims require extraordinary proof/evidence. So where’s the real-world physical evidence that natural factors are 0% responsible for changes in net ocean heat content since the year 1955? Once again you are missunderstanding what I wrote on purpose. Natural factors didn’t cease to operation, why would they? I’ve read the Rosenthal 2017 paper, did you? Because then you would know that the rate of change today is far higher than in any other time in the last 12000 years. +0.033 °C per decade vs. -0.002 °C per decade between 10 and 2 ka vs. -0.013 °C between 1200 and 1600 CE. The change from 1200 to 1600 was caused by a negative forcing of -0.2 W/m² (+- 0.1) while total anthropogenic radiative forcing is +1.6 W/m² (+- 0.8) … writes the author. The amount of energy needed for the observed change today is small enough to be explainable by CO2 forcing alone. So you’re comparing the overall change for an 8,000-year trend to the overall change for a 55-year trend, claiming that’s an apples-to-apples comparison, and then asking me if I’ve read the paper. Unbelievable. I did an entire write-up on the vacuousness of comparing a 55-year “trend” to an 8,000-year trend and calling it statistically meaningful. It’s like claiming the Earth’s temperature is cooling at a rate of 7 degrees C per decade because we’ve chosen a one-year period (2016, when it cooled by -0.7 C) and ignored the 200-year trend. Wow, 2016 changed much more rapidly than the temperature did during those 200 years, so that proves humans are having a demonstrable impact on the climate. I guess I shouldn’t be surprised that you didn’t pick up on the statistical malpractice here, as you do it yourself routinely…cherry-picking short-term trends and ignoring the long-term context. So how did Rosenthal et al. leap to their conclusion? By oddly deciding that it is scientifically defensible to directly compare an 8,000-year-long trend to a 55-year trend (1955-2010) — which, statistically, is much like comparing an 8-month-long El Niño-dominated temperature anomaly to a 37-year-long temperature trend. In other words, Rosenthal and co-authors were able to claim an unprecedented modern warming rate by cherry-picking an extremely short-term period (1950s-present) and by simultaneously ignoring all the other short term (<100 years) trends (from their own reconstructions) that greatly exceeded modern temperature changes in both rapidity and magnitude (as the graph above illustrates). Interestingly, Bova et al. (2016) recently found that during the Holocene there were short-term “natural” ocean warming trends that achieved amplitudes of more than “2.0°C within 200 years” at the 0-1000 m depth, which is about 5 to 10 times the rate of warming (more than 0.1°C per decade) compared to the 0.015°C per decade warming rate in recent decades (1971-2010) at the shallower 0-700 m depth. There is NO CO2 forcing where water surfaces are concerned. 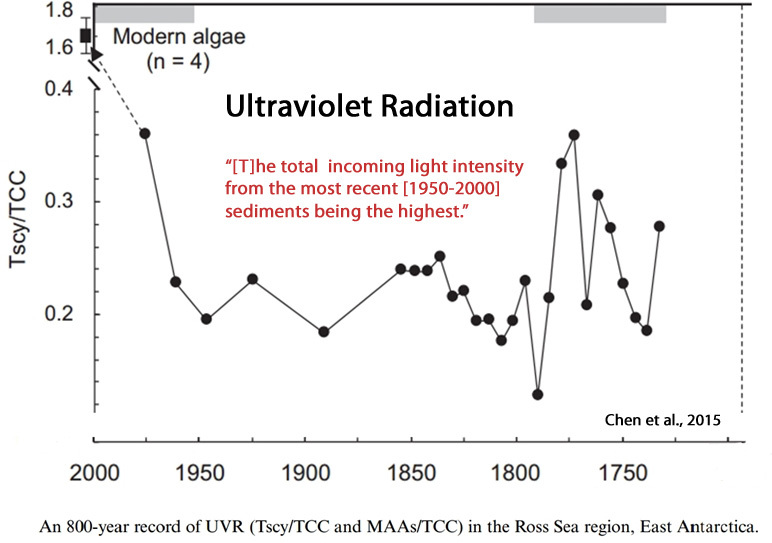 LW radiation (which is not from CO2 at sea level anyway) DOES NOT have the capability of warming ocean water. Learn some basic physics, seb. You are making a monumental fool of yourself. Or maybe the models tell us something about a flat disk floating around with no nighttime bathed in an equivalent of constant averaged solar radiation. As laughable as believing the earth’s atmosphere act like glasshouse, a glasshouse with no roof in reality. 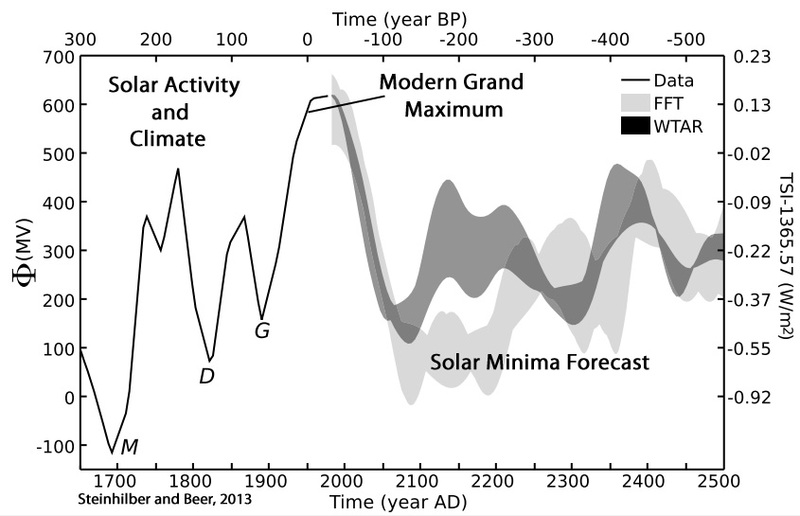 So if we have the modern Grand Maximum of solar activity (above links) to attribute to the warm-up since the depths of the Little Ice Age solar minima coolings, does that mean that 100% of the OHC change is caused by that forcing too, or does this only count when it’s a forcing that agrees with your beliefs (i.e., CO2)? There is NO FORCING from atmospheric CO2 on ocean temperatures. Proven to you time and time and time again, but you REFUSE to accept the well known basic physics that LW radiation from above DOES NOT HEAT WATER. !! Your mindless, unsupportable yapping is becoming a childlike irritant, seb. Calculate how many Joules that TSI change caused to accumulate and compare it to the OHC change. Then you have your percentage. Without the TSI change OHC would have changed less, if that percentage is over 100% than you could also say the TSI change is completely responsible for the increase in OHC. It’s an accounting thing. If 10 people give you 100 dollars each and you end up 100 dollars richer, then removing anyone of those 10 people removes that increase from your balance. So all of them could be made completely responsible for your increase. Got it? The difference between TSI change and CO forcing is that the later one is caused by humans. And if we want to know if we are responsible for changes of the climate then we have to look at what we did. CO2 forcing would not have occured without us, TSI change happens all the time and doesn’t depend on humans. Its about PHYSICS and the FACT that LW radiation does not heat water from above because it only penetrates a tiny fraction of a mm, causing evaporation instead. Your continued WILFUL IGNORANCE of this basic FACT is utterly mindless to say the least. Now you are just making stuff up AndyG55. Of course you can take an IR emitter and warm water from above. And if that emitter emits about the same as the atmosphere does and you would add an energy source to the water you would of course notice that the water will get warmer than without that emitter. You have PROVEN time and time and time again that the is NO SCIENCE backing the thought-bubble that CO2 causes ocean warming or CO2 causes warming in a convective atmosphere. You are still an empty seb-sack with absolutely NOTHING to support your baseless anti-science, anti-life anti-CO2 AGW religion. “…but why do some people think that all changes can be attributed to the Sun or other natural sources of warming/cooling? Just so “it can’t be CO2”? Why? Because there is not one experiment that proves this to be the case that’s why! In real science the case is proved by experiment and observation, not some half-wit’s theory! Ok, so when space probes are launched, is there a preliminary mission to test if gravity really is what we expect it to be from the laws of physics on the chosen path? When we determine the temperature of celestial objects, do we send probes with a thermometer to actually measure the Sun’s surface (just an example)? The goto argument for skeptics “there is not one experiment that proves this” is in itself correct, but it misses the point that we know the physics of CO2 and bodies with mass and therefor heat capacity (doesn’t matter which material). Those “building blocks” are all proven and the combination of them will not result in surprises as long as the laws of physics are universal. It could very well be that ocean water bends those laws so radiative energy transfer don’t apply, but that proof would be on you I guess. Also why is the emitted radiation (ocean surface) not equal to the radiation into a vacuum then? What effect causes the oceans to lose considerably less energy through radiation? If we had two identical, side-by-side enclosed glass greenhouses A and B with identical containers and identical amounts of water in each (and nothing else), and in one greenhouse (A) there was 500 ppm CO2 and the other (B) had 400 ppm, what would the difference in water temperature be for each of the two greenhouses? Since we “know” the physics of CO2 and bodies with mass (especially water), surely you can provide the physical measurements. So what are they? Do you think the water in those two bottles has the same temperature? SebastianH believes that Alka Seltzer — which causes a chemical reaction in water which creates pressure in a very small enclosed space — demonstrates that an explosion of CO2 in an enclosed space is demonstrably like how CO2 in the atmosphere spaced apart at 1 part per 10,000 works to trap heat in the 0-4000 m layer. There is no control here. CO2 has not been isolated. I guess it’s news to you that CO2 molecules in the air do not function the same way as Alka Seltzer and water in an enclosed bottle. Again, I asked you to answer a FAR more pertinent question with regard to CO2-heating-water claims. It doesn’t involve Alka Seltzer chemical reaction pressure. It involves the Sun, not a light, and it involves introducing CO2 in volumes of ppm that are similar to what’s happening today (400 ppm vs. 500 ppm). And I notice you still cannot answer the question…even though you necessarily should have physical measurements already since you claim to “know” what CO2 does. You don’t have a scientific paper to point to. You don’t have a controlled scientific experiment to point to. You don’t have physical measurements to point to. You don’t have observational evidence to point to. You don’t have correlating historical evidence to point to (CO2 rose while OHC plummeted for the last 1,000 years). But you do have one thing: an Alka Seltzer youtube video. That’s what your entire case rests upon. I’m almost starting to feel sorry for you. But the vast majority lives in a convectively controlled atmosphere. This video is a fraud. The excessive heat difference is due to the Alka Seltzer, and the fact the light is directed more towards favored bottle. co2 does not light up like that. This fraudster knows exactly what he’s doing. A change from 400 ppm to 500 ppm in a small container doesn’t simulate what’s happening in Earth’s atmosphere and you should know that, after all you are screaming “magnitudes” all the time. It makes a difference if there is 100 km of atmosphere containing CO2 above your water surface or just a few meters. The effect is small enough already and only an issue because it is there 24/7 and you expect it to be measureable with your setup? Why? You don’t have correlating historical evidence to point to (CO2 rose while OHC plummeted for the last 1,000 years). Please don’t act like I am saying that CO2 is the only thing that can change OHC. Those bottles demonstrate that CO2 absorbs infrared. That’s all. So you don’t believe what you just wrote yesterday when you claimed that 100% of the heat change in the ocean since 1955 is caused by “that forcing”? I had thought that 100% = “the only thing”. What forcing were you referring to that causes 100% of ocean heat changes, then, if you didn’t mean CO2? Says the very same person who linked to a youtube video involving Alka Seltzer, capped 2 liter bottles, and an artificial light (shining directly onto one bottle more than the other) to suggest that that is how CO2 heats water. My suggested experiment isn’t about simulating “what’s happening in Earth’s atmosphere” — and you know that. It’s simulating how to test how much of a water temperature change, if any, is elicited by changing one variable: airborne CO2. That’s what this is about SebastianH. If we had two enormous, identical, side-by-side, enclosed glass greenhouses, A and B, each with identically large tubs of water (and nothing else in the greenhouses), and in one greenhouse (A) there was 500 ppm CO2 and the other (B) had 400 ppm, what would the difference in water temperature be for each of the two greenhouses’ tubs with the one greenhouse having 0.0001 more CO2 in the air than the other but both having identical Sun-heating? This isn’t about the atmosphere. It’s about CO2 as cause of water temperature changes. You said we “know” the physics of CO2 and bodies with mass (especially water), surely you can provide the physical measurements. So what are they? Further more, experiments with CO2 in double glazing show that CO2 filled gap actually transmits more energy than air filled gap. CO2 acts as a conduit for surface cooling, because it enhances radiative transfer of energy. There is absolutely ZERO CO2 warming signature in either satellite data set. And there is absolutely ZERO science to back up the anti-science imagining that CO2 causes warmer oceans or causes warming in a convective atmosphere. And seb.. you have PROVEN that fact by your manifest INABILITY to back up the most basic LIES of the AGW scam with anything except mindless brain-washed rhetoric, and fantasy meaningless analogies. Kenneth, this borders on trolling. Is my English really that bad or is this on purpose? Take a glass and fill it with water (it’s full). Now put small stones into the glass and watch the water overflow. The 10th small stone will cause 100% of the last overflow event, but you can attribute the amount of water lost to any stone in the glass, because they all displace the same amount of water, the amount that was lost at the last overflow event. Got it? So if you have multiple forcings all 0.5 W/m² in magnitude and the change in heat content would be caused by just one of those forcings, then you can attribute 100% of the change to all those forcings … math! How would you design an experiment that proves that CO2 climate sensitivity is very low or doesn’t exist? So if “those forcings” are changes in solar activity or cloud cover, would that mean you agree that climate change is 100% natural, or do you exclude those natural factors from the equation because….CO2? RealClimate conducted an experiment using clouds as a proxy for CO2 and found that the temperature gradient for the hair-thin skin layer (which is the only “depth” CO2 can penetrate) is just 0.002 K. That would not appear to be large enough to heat the depths of the ocean with, especially relative to the Sun’s incoming 500 W m-2 that can heat the first 30 meters of the water, and the first 2 meters by 2 K within a matter of hours. Do you think 0.002 K can compete with that? At what point was it established that modern ocean heat content changes have fallen outside the range of natural variability? Isn’t that the first step to demonstrate that something unusual is happening now? Seb , the ONLY person being a TROLL here is YOU. That is your hole purpose. You are not here to discuss reality and facts. And yet another MORONIC ANALolgy showing that seb has ZERO knowledge of the effect of LW (not from CO2) on the surface of water. His childish low-knowledge trolling is getting truly pestilent. So with all that blather about gravity etc you can still offer NO objective proof. Science is not about conjecture and fantasy, science is about observation and verification. You have NO verification! Not one experiment! You believe in a physical effect here on this planet, here in this atmosphere for which you can offer no proof! Yep, THAT says it all! But to you a negligible change in a very rare atmospheric gas is more powerful than all the variations of the SUN. And no it is NOT like gravity or anything of that kind. It IS about money and power and how to con people into believing weather and climate is so predictable. It’s exactly like gravity. You don’t ask for measurements of an object falling towards the surface on the Moon or another planet to “believe” that it will do just that, do you? We already have measurements of the force of gravity on objects. We know how fast a particular object will fall from a given distance because we’ve measured it. And replicated it. In the real world. On Earth. We also have physical measurements for how much and how quickly solar radiation heats up the first several meters of the ocean water. We know how deeply UV can penetrate the ocean surface. We have temperature measurements for the skin layer. We have satellite observations of cloud cover changes. We have no physical measurements showing how much heating or cooling is caused in water bodies, if any, when we change the airborne CO2 by 0.000001. No scientific experiments. No observation. No replications. No physical measurements. Who needs measurements or observations or real-world scientific experiments when we have our assumptions and beliefs to tell us what is truth? Right? What we do have measurements for is the FACT that evaporation COOLS the surface of water, or any other wet object, and that LW radiation aids evaporation. seb just ignores the FACTS, and makes up child-minded analogies in a vain attempt to prove his imaginary planet where CO2 actually warms water or a convective atmosphere actually exists. The problem is the wavelength of LWIR, and its known and uncontested absorption characteristics in water. If increasing levels of CO2 in Earth’s atmosphere is causing an increase in DWLWIR, then water is essentially opaque to IR at this wavelength such that any increase in DWLWIR cannot effectively heat the bulk oceans. The optical absorption of LWIR is such that it is almost fully absorbed in just 10 microns of vertical penatrative depth of water, and since DWLWIR is omni-directional such that some of it is interacting with the oceans at an inclination of 10 degrees, some at 20 degrees, some at 30 degrees, and so on, with only a little at 90 degrees vertically, DWLWIR is fully absorbed in about just 6 vertical microns. It is this fact that gives rise to an insurmountable problem to the argument that CO2 is heating the deep oceans. People are not putting forward alternative explanations/proposals simply because they wish to argue against the warmist’s CO2 mantra. Rather, It is because CO2 cannot be the explanation as to why the deep ocean has warmed these past 50 or so years (if indeed the deep ocean has warmed at all over this period), that people are looking for an explanation that plausible explains the warming. Personally, I consider that we have no reliable or worthwhile information/data set on the oceans. Everything is little more than guess work, which ought to attract huge error margins. I make this statement from having spent approximately 25 years studying ship’s data, from which study I conclude, from a scientific perspective, ship’s data is not worth the paper it is written on. ARGO has the potential to be worthwhile, but first, the data set is too short to be of much use, second there is insufficient spatial coverage given the vastness of the oceans, third, it has never been tested for bias which may be caused by the free floating nature of the buoys which are carried along/transported on currents which currents are themselves density/temperature dependent, and fourth, counter to scientific pronciples, the gatekeepers when reviewing the results of their data decided that the coolest reading buoys must be returning ‘faulty’ data and simply elimanted the output from these buoys from the data set without returning these buoys to the laboratory for testing to see whether there was a real fault or calibration error/problem with the buoys. This later action has forever tarnished the reliability of the ARGO data set, and shows a complete disregard to ordinary standards of quality control. Other problem with ARGO is that one of the guys doing the data processing admits to throwing out “cold” measurements, and has proven himself to a manic AGW activist. A rational, real scientist also needs to get their hands on the raw, untampered data. Richard, the downwelling LW radiation is not heating anything directly. It prevents the ocean from losing energy. So an increase in that radiation results in internal heat buildup until a temperature is reached where all incoming energy gets emitted again (by evaporation, radiation, etc). You live in a total FANTASY world seb. One TOTALLY UNSUPPORTED by any known science. PROVEN by measurements that LW radiation actually COOLS the surface layer of water. But just keep IGNORING MEASURED FACTS. IGNORANCE is you only remaining facet, seb. And you are FULL OF IT !! Nope, the slope of the temperature gradient in the surface layer decreases and therefor the transfer of energy from the lower layers towards the atmosphere/space. That has been measured. You can not cool a surface by external radiation, no matter how much evaporation is caused by that radiation. That would violate the laws of thermodynamics. seb proves he knows NOTHING of latent heat. Evaporation cools surfaces. Known, measured. And we all know that seb only imagines he has knowledge of thermodynamics, just like he imagines everything else. Oh look, seb has just discovered that water vapour slows the lapse rate. Yes, we all know that seb… a remarkable discovery for you, no doubt.. maybe he finally learnt something. !!!!!. But again, because of his absolute ignorance of hydrology and latent heat, thinks this slows the transfer of energy. Why are you so, so ignorance of basic physics, seb ??!! The maximum free path length of CO2 wavelength emissions in the lower atmosphere would be around around 10m. Even you should be able to figure out the REALITY… if you actually wanted to, that is. Any radiation absorbed by CO2 in the lower atmosphere is immediately thermalised to other molecules and dealt with by the gravity based thermal gradient. The thermal gradient is an easily measured and observable FACT, and CO2 has absolutely ZERO effect on it, no matter how many magic mushroom seb wants to eat. The radiation can be measured. Are you suggesting that this is an imaginary measurement? Back to back measurements near the surface of water show a net outward flux of radiation. CO2 does not radiate below 11km. The mean free path of CO2 radiation in the lower atmosphere would be 10m or so. seb continues to wilfully ignore FACTS. Sebastian, I appreciate your comment, but as I point out in my comment richard verney 29. May 2017 at 2:29 AM, whatever the changes in DWLWIR is doing, as a consequence of rising levels of CO2 in the Earth’s atmosphere, it cannot (yet) have impacted on temperature changes in the deep oceans say 2,000 to 4,000 metres. Ocean overturning is carried out at a very slow rate, for example, the Thermohaline circulation is circa 1000 years. Obviously every ocean basin overturns at slightly different rates, but that is the order of magnitude that we are talking about. Consequently, even if DWLWIR helps say the top 15 metres of the ocean retain more of the energy that it has received from solar (the bulk of solar irradiance is absorbed in the top 2 to 15 metre range) because it prevents the oceans from losing as much energy (the reason you suggest), it still cannot explain why we are seeing the deep ocean warming. Given the rate of ocean overturning, anything that has caused the deep ocean to warm (and I am sceptical as to whether there is any deep ocean warming) must have taken place well over a century ago. It cannot be explained by the increase in CO2 these past 30 or 50 or even 70 years since there has been insufficient time passed to see what effect, if any, this increased CO2 (and resultant DWLWIR) has had on the deep ocean. One needs to look at the physical processes involved, how and where energy is absorbed, what becomes of that energy, how, where and at what time scale energy is being dissipated/distributed polewards by oceanic currents and downwards due to overturning etc. Presently, there is no known mechanism whereby energy absorbed at the very top of the ocean (by what ever process that energy is being absorbed/retained/ reduced heat loss etc) during the recent past can result in the warming of the deep oceans allegedly measured as happening these past 10 or 20 years, and therein lies the problem. The devil is always in the detail, but unfortunately, climate science does not like doing detail; for example the use of averages, and anomalies etc. Some of the sound bites appear superficially attractive or reasonable, but it is only when you start diving into the detail that obvious problems arise. DWLWIR and the oceans is one such area. That’s basically the reasoning behind the warning of AGW alarmists, that the oceans will accumulate heat for a long time to come, even if we would completely stop emitting CO2 tomorrow. http://imgur.com/a/ZmLRy (Rosenthal et. al 2017) shows that heat content changed less in greater depths. The heat doesn’t need to “travel” from the top down to the bottom of the oceans. In a traffic jam the cars at the beginning also do not need to travel to the end and yet they do have an influence on the end. OHC change is slower in lower layers of the oceans. Also: the heat does not have to “travel” from the top to the bottom. It’s just like in a traffic jam, the first car that causes it doesn’t have to “travel” towards the end of the traffic jam. The cars at the end just stop because every other car in front of them stopped representing a resistance in traffic flow. And yet another child-mind analogy. Your ignorance confounds you, seb. DWLWR does NOT heat water. Back to back radiation measurements near the ocean surface show a net outward flux. This planet is a water world. I envisage that we can all agree that this planet is dominated by the oceans where about 95% of the specific heat content is stored. It follows from this one single fact, that unless CO2 can heat the oceans, it certainly will not be able to heat the planet. We know from the absorption characteristics of the wavelength of DWLWIR that it is fully absorbed in about 6 microns vertical depth of water. Let us for the sake of argument assume that DWLWIR heats those 6 microns, as warmists claim that it does. The first consequence is that this energy/heat absorbed in the top microns of the oceans drives evaporation and thereby depletes the energy entrained in the top 6 microns (indeed the top millimetre of the ocean is cooler which testifies to the evaporation from the very top of the ocean). It ought to be uncontentious that is only if there is surplus energy over and above that which is used in driving evaporation from the top of the ocean, that DWLWIR could heat the oceans. Hence, let us suppose that there is surplus energy in the 6 micron layer over and above that driving evaporation, this begs the question: at what rate is this surplus energy sequestered to depth so that this surplus energy can heat the deep oceans? In other words, how long does it take for energy absorbed in the top 6 microns of the ocean to be sequestered to a depth of say 2,000 to 4,000 metres such that it can heat the deep ocean? We know that the deep ocean circulation takes about 1000 years, so we know that additional DWLWIR from increased CO2 emitted since about 1950 (the date when manmade CO2 emissions began to rise and become a factor), is less than 70 years and this would appear to be insufficient time for energy absorbed in the top 6 microns to make it way down to the depths of 2,000 to 4,000 metres. If the deep ocean is warming at those depths, it appears that it is not because of CO2. It is not because there has been an increase in DWLWIR these past 70 years due to increases in CO2 concentration in the Earth’s atmosphere. And of course a long term drop in north Atlantic atmospheric CO2 levels. Seems CO2 is not at all well mixed in the atmosphere. Must be a drop in atmospheric CO2 over the North Atlantic. Why do you believe that AGW proponents think CO2 would be responsible for every change in every locale? Are you saying the Sun is not shining as bright on that part of Earth’s surface as it used to? CO2 has ZERO effect on temperature.. as you continue to show with your total inability to produce one single bit of real science to back up your farce. Good to see you admitting that..
Well done seb.. tiny steps. !! The oceanic-atmospheric system is poorly understood, including transfer of heat from one basin to another, transfer of mass from the depths to the surface and vice-versa. This also includes the Carbon pumps. Perhaps one of the biggest quandaries for the anti-CO2 alarmist argument is the decline in global mean surface temperatures from approx. 1940-1970, despite a marked increase in CO2 emissions. Some tools even attempted to claim that the foundation of the US EPA actually stopped the cooling, since all the coal combustion particles emitted from 1940-1970 (causing cooling) were of course miraculously stopped at that point. Fast forward to 2017: the problem is resolved through flattening the temperature peak in the early 1940s, thereby hiding the decline through the early 1970s. Someday, the MSM will realize this and report on it. Thank you, Professor Gosselin, for this report.